I have been playing with Air apps for the last couple of months while the product was still in beta. There are a lot of clever applications that are more like widgets then conventional full-blown desktop programs. For example, the Adobe sample app PixelPerfect was a simple ruler overlay letting you measure anything on your screen. This little tool comes in handy for web development where there aren’t any rulers on the side or measuring tools like in Photoshop. Powerhouse auction site eBay created their own Air app that banishes the concept of refreshing the page so bidders can watch their auctions in real time. But perhaps the biggest crowd of Air apps belongs to Twitter clients. Thwirl, Spaz, Tweetr, and Snitter are just a handful. 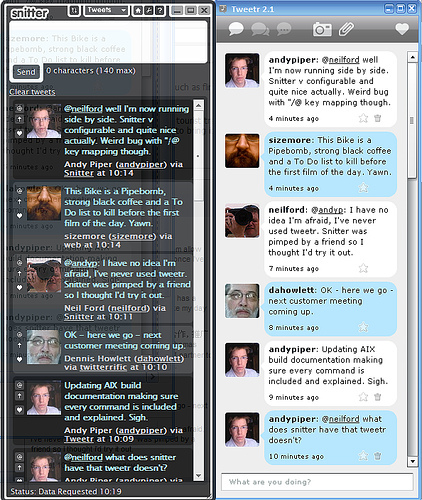 I thought John Ballinger had let his Twitter client, Tweetr, go to pasture without an update since the end of November. With each new Air beta release more functionality would break edging me towards Jonathan Snook’s Snitter. But alas, Tweetr is alive again with version 3.0 launching today to coincide with the official Air release. I’m happy as a clam to have my favorite Twitter client back and to see so many great ideas that have seemingly sprung out of Air. Hey, thanks for the linkage! Ironically since comparing Snitter and Tweetr I’ve now moved over completely to Twhirl, which is working great with AIR 1.0 and, well, “is just, better” than the others… can’t really explain why but it really grabs me more than the other options. Democracy means that anyone can grow up to be president and anyone who doesn’t grow up can be vice president.